If I ever made a list of things that I have to do before I leave god's green earth, then riding to Leh-Ladakh would be right at the top. Now I can't help but have a huge grin on my face as I put a tick off that item after participating in the Royal Enfield Himalayan Odyssey 2011. Day 1, the Odyssey is flagged off from India Gate and the journey of more than 2500kms started from a place of immense historic value to the country. 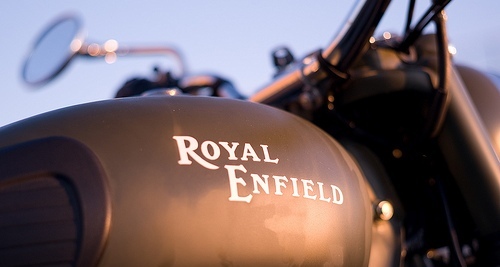 As we commenced the ‘Testing, Tiring and Tempting’ journey to the land of the lama, the sight of 73 Royal Enfields riding in formation in my bike’s rear view mirror brought a rush of feelings to my heart - a heady mix of excitement, eagerness and adventure. The road to Chandigarh was a long, boring stretch of tarmac extending as far as your eyes could see and in fact even beyond that. But I believe that this was what worked in my favour as frankly I am not much of a Bulleteer, having barely ridden a Royal Enfield a few times in the city. The road to Chandigarh gave me an opportunity to get acquainted with the bike and figure out what she was capable of. For me, the actual journey started on the day we rode from Chandigarh to Manali. The road was curvy and topped with silky smooth tar, with the river Beas flowing along the left hand side of the road. As much as people hated the ride from Chandigarh to Manali, mainly for the fact that it rained, I on the other hand loved every minute spent on the bike. Though the heavy rainfall ensured that I was left with utterly soaked gloves, wrinkled and blackened hands, the entire route till Manali was fun with a capital ‘F’. To sum it up in a word, PERFECT! The next stop was Keylong. It was the first day that Sachin Chavan, from Royal Enfield said ‘today is going to be your toughest day of the Odyssey’, of course at that point in time we didn’t know that these words would be become the mantra of the morning briefing in the days to come. On the road to the first re-group of the day we didn’t encounter many hurdles, but as we came closer to Rohtang pass, our difficulties multiplied in no time. With muck almost as high as the foot peg, it was becoming increasingly difficult to ride, and to add to that, traffic! The couple of kilometers of the mucky road caused greater damage to a lot of bikes than on the entire trip - snapped clutch cables, burnt clutch plates and all sorts of trouble. Before entering Keylong we refueled at a pump near Tandi, the last fuelling pump before Leh. Keylong to Sarcu, was the most strenuous and physically testing ride of the Odyssey. By the end of the day, Sachin’s earlier words really rung true. The ride for the first 40kms, till Darcha, was comfortable as compared to the remaining 90kms of the day. After the regroup at Darcha, we came across a massive water crossing where a lot of us got stuck for a good 2-3 minutes in ice cold water. Even throttling hard and trying to move the bike back and forth didn’t help at all. Finally, we were left with no option other than have two or three guys pushing each bike until it cleared the crossing, at the end of which my legs were almost frozen and completely numb. This was where the advice my colleagues had given me before setting off on the ride of keeping a spare pair of gloves and socks really paid off. With no idea about just how many of such excruciating crossings lay ahead, a quick change to dry socks was just the thing I needed to lift my spirits and keep riding. A few more crossings led us to our second regroup at Bharatpur where hot glasses of water and bowls of hot soup were just the things needed to lift the soggy atmosphere. Sarchu introduced a lot of riders to Acute Mountain Sickness (AMS), enough to give the doctor a good workout running from camp to camp attending to all the ailing. The altitude didn’t spare me either. 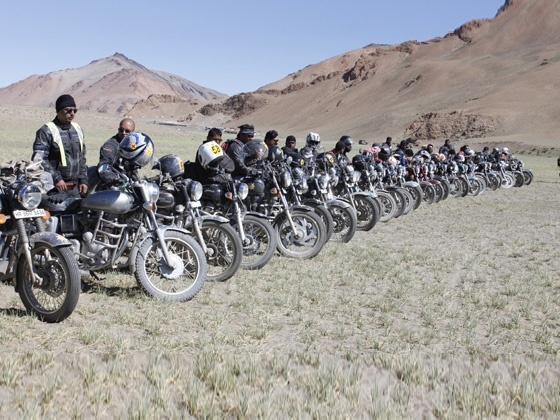 The day after we reached Sarchu, we were to ride a distance of 250kms across the More planes to reach Leh. That was one morning when I didn’t feel like getting onto the bike, thanks to a terrible attack of nausea and dizziness. Popping a couple of pills and forcing down breakfast down didn’t help much either. I was almost tempted to load the bike in the truck and go in the safety car, but I thought better of it. Once on the bike though, all the sickness and queasiness suddenly vanished, and we were off to Leh. Riding through the More planes was an experience that can be described with just one word – beautiful. With huge mountains all around you and a single stretch of a long straight tarmac through them it is simply a road where you set yourself in cruise mode and look at the hill-scapes all around. And with no other vehicle around you for miles, the feeling is one of vast solitude. 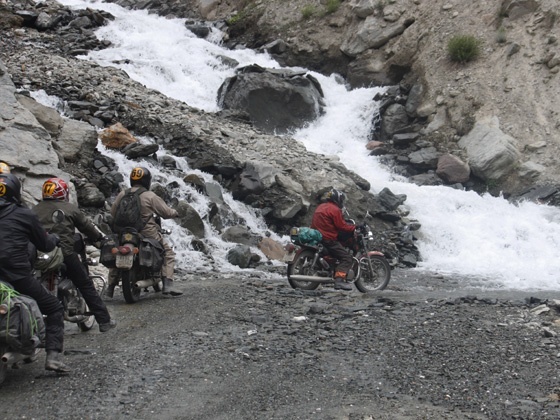 Beyond the More planes was the ride through Gata loops and the younger sibling of Khardung La, Tanglang La – the second highest motorable road in the world, eventually leading to Leh. Riders were more than happy to reach Leh mainly for the fact that the following day was dedicated to rest and repair, which the riders and the bikes were in desperate need of. After the rest day, the participants were all set to ride across the highest motorable road in the world - Khardung La. Khardung La ended up being an extremely ceremonious place, with riders happily clicking photos with much gusto and celebrating the successful completion of half the Odyssey. On the other side of Khardung La, camping at Nubra was completely relaxing. With a stream flowing right next to our tent and the quite surrounding amplifying the sound of flowing water we all wished for a few more days to stay at the place. But alas it was a time bound trip. On our way back to Leh from Nubra, we encountered snowfall at South Pulu clubbed with traffic. The Odyssey is not just about riding to the Himalayas, there is more to it than that. It’s about learning to ride on different terrain, learning from your mistakes and others’, learning how to master the art of riding in the ghats and ofcourse savoring the beauty of Himalayas while you ride. To sum it up in a few words, a quote from the CEO of Royal Enfield, Mr. Venki Padmanabhan, which would perfectly describe the Odyssey “If you go to the Odyssey as a boy, you will return a man; if you go as a man, you will return a sage, and if you go as a sage, surprisingly you will return as a boy”.